As a country founded on large-scale immigration, Australia has been teaching English to its new arrivals for many years. However it was not until Australia developed its National Policy on Languages in 1987 that other countries began to view it as a world leader in English as a Second Language (ESL) education. Although the future was looking bright for ESL in the late 1980s, a change in government led to prioritising the literacy skills of all students over specialised support for ESL learners. As well as comprehensively outlining Australia's immigration and language education policies, Kawakami gives readers an insight into the experiences of English learners in three Australian states through use of case studies. This contextualises Australia's language policies by describing how they manifest in the day-to-day running of specialist ESL schools in Sydney, Brisbane and Melbourne. Both researchers and educators will benefit from Kawakami's detailed descriptions of the practical elements of ESL education such as student enrolment, orientation, placement, assessment, timetabling, utilisation of staff and curriculum. Kawakami links his Australian research to Japan both through sharing the stories of three individual students and by describing the experience for Japanese students in Australia in general by exploring their opportunities for Japanese language maintenance. Finally, he asks what Japan can learn from Australia's approach to educating immigrant children with regards to national and individual identity, assimilation and citizenship. 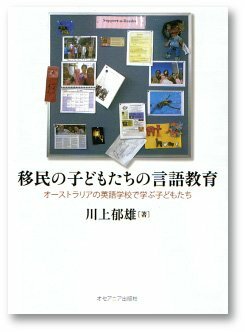 Language education for the children of immigrants captures the realities of ESL education in Australia from the macro level of policy to the micro level of an individual's own experience, and offers researchers and educator an insight into the workings of a society with significant ESL needs. © 2010-2019 KAWAKAMI, Ikuo Lab. All Rights Reserved.